How to grill the most delicious, juicy, and tender steak! Plus, an insanely good steak marinade recipe. Looking for more steak recipes? Check out these Asian Steak Bites, this skillet steak, and this Grilled Flank Steak. The boys have been playing outside pretty much nonstop. We don’t have our yard in yet and they are LOVING that. They go out with little buckets and miniature shovels and can play for hours on end. The other day I decided to vacuum out my car while they played in our “dirt bed” by the garage. It started getting pretty warm outside so I asked the toddler to go grab sunscreen so I could put it on them. After explaining exactly where it is, (and telling him NOT to put any of it on himself) he nodded and went inside. When he didn’t come out for a bit, I knew there would be trouble. Sure enough, my instincts were right. He’d found what he thought was the sprayable sunscreen, but was actually sprayable DIAPER RASH cream. And of course sprayed his entire body with it. Turns out diaper rash sprayable cream is even stickier and grosser than sunscreen on a dirt-covered body. Who said being a boy mom was easy? 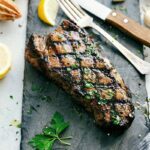 But one thing that IS easy is this delicious steak recipe and steak marinade:) Read on for more! Ever since attending the grilling camp I shared about here I’ve been OBSESSED with grilling. Seriously, it’s my newest hobby and I’ve grilled just about every day this month. Before going to that bootcamp I grilled a bit, but it was usually just been chicken or shrimp and occasionally a steak — nothing too crazy. Since coming back from the camp and reading just about everything I can about grilling (really, I’m so weird. ), I can’t get enough. And one of the things I’ve learned is that when grilling steak, the steak marinade you use makes a big difference. 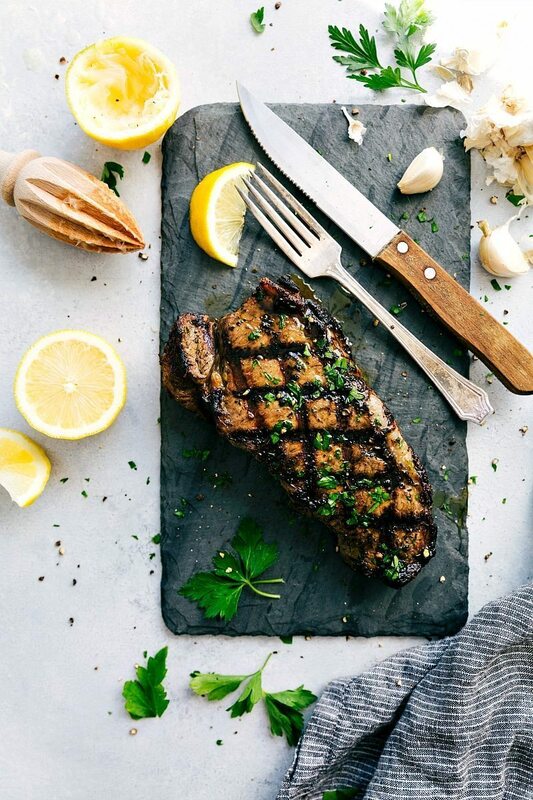 Lucky for you I have a great steak recipe I’m sharing with you below, complete with a steak marinade recipe as well. 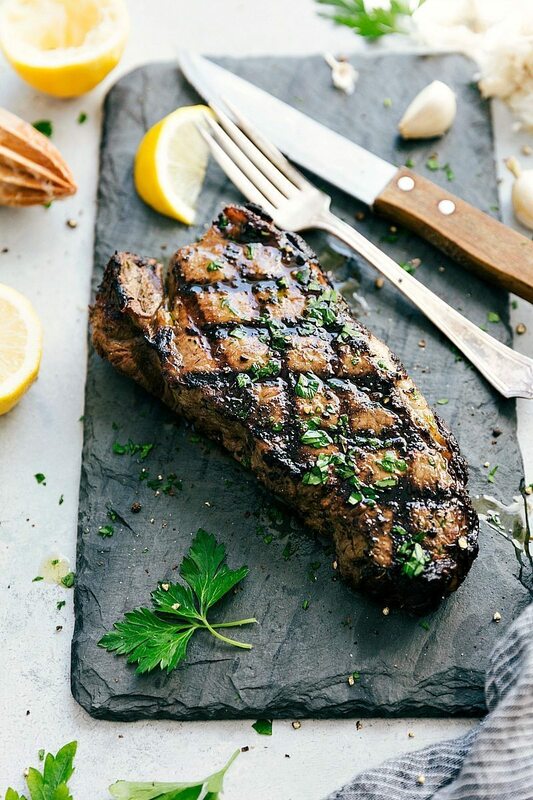 What Are The Best Steaks To Grill? The meat you buy matters! Typically the more expensive the meat, the better it’s going to be. I’ll occasionally splurge, but for weeknight dinners, I’ll usually get a good value steak at the grocery store. 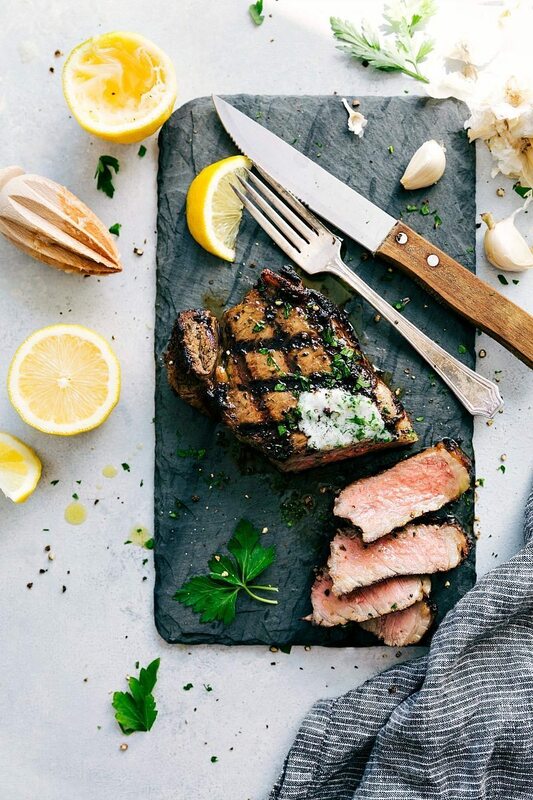 The steaks from the butcher will be likely double the cost (and you likely wouldn’t want to add a marinade to those anyways — just a generous sprinkle of coarse salt and pepper.) So, for this marinade recipe, a good value steak from the grocery store will work great! I think this marinade takes a good value steak to a WOW steak! Look for thickness: Try to get a steak at least an inch thick and preferably 1 and 1/2 – 2 inches thick. The thickness helps you get a beautiful red center. Try to get the center cut — the center cut helps to ensure even cooking which is super important on the grill. Generously OIL your grill grates. When the grill is fully heated, clean it well with a wire brush, and then roll up a few paper towels, drench them in oil (I use canola), and (using tongs that are holding the paper towel wad), rub it along the grill grates generously. Cleaning the grill and brushing it with oil will give your steak gorgeous grill marks and contribute to a beautiful sear. Make sure the grill is completely heated before you add your meat. High heat is going to sear the surface of the meat which will give you a juicier steak and allow the steak to get an amazing char. Use tongs to flip the meat. Don’t stick a fork in your steak and flip it that way because the delicious juices will have a chance to escape. Use a meat thermometer. The best way to ensure your meat is perfectly cooked to your liking is by using a meat thermometer. If you grill a ton you can often tell just by looking at a steak or by gently pressing on it if it’s done, but I still like knowing FOR SURE with a thermometer. I usually pull off the steak about 5 degrees below what I want it to be at — it cooks a bit more after being taken off the grill. For DIAMOND Grill marks: Place the steaks on the grill grate diagonal to the bars of the grate After 2-3 minutes, rotate the steaks 90 degrees to get a crosshatch of grill marks. Let the steak rest before cutting into it. Once the steak is perfectly grilled, it needs a bit of time to rest so the juices can re-distribute evenly throughout the meat. By letting the meat rest, you will have a juicier steak! I cover the steak in foil and let it sit for 5-10 minutes before cutting into it. 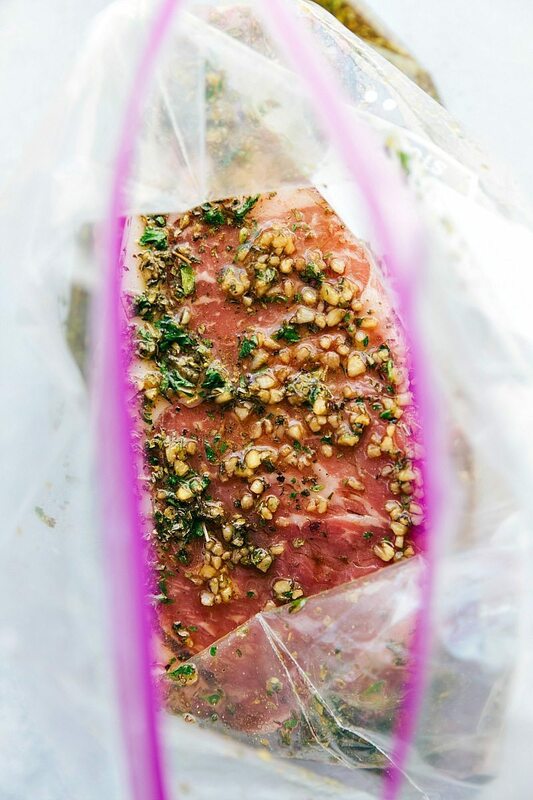 This easy steak marinade takes minutes to whip together and takes a value/budget steak from good to AMAZING! *Different temperatures for the doneness of steaks are found in the last section of text for this recipe along with tons of other grilling tips! hey girl- love the post! The steak looks so yummy! We need to also buy a grill! Thank you so much Shawnna! 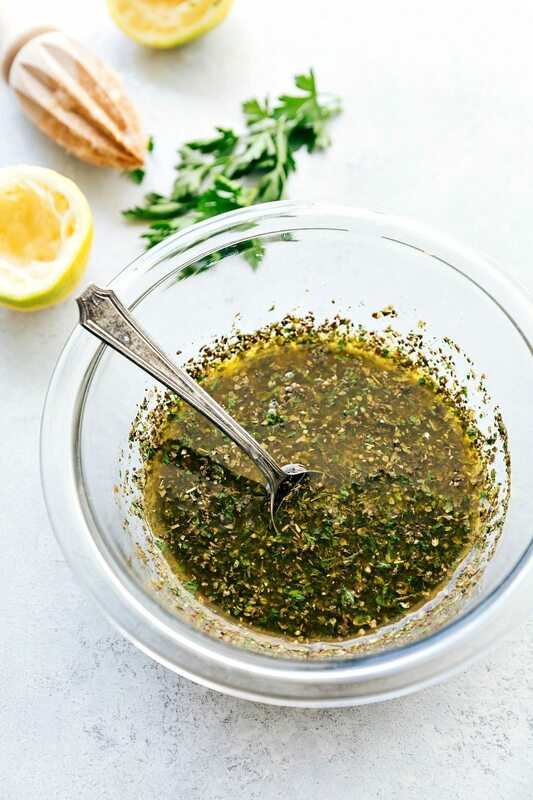 Loved this marinade! I only made half of the recipe but it still turned out wonderful! My husband loves it and insists that I make it every time we grill steaks. Your photos are simply stunning!! The steak looks scrumptious– delectable and juicy as a steak should be. Can’t wait to try this! Thank you so much for your kind comment Lorrie! 🙂 I hope you love the marinade! Just a quick question, is it really supposed to have minced garlic AND garlic powder? Or is it supposed to be onion powder? I just feel like that’s a lot of garlic, lol! Hey CHELSEA, I just love grill steaks and I love a girl who appreciates meat! These are perfect for grilling season. Marinade is more expensive than the steak! These photos are very amazing, i liked the exciting flavours that you have used in your recipes.I will also try to use these perfect blend of flavours in my recipes.